Thank you…I started my first batch this week. 🙂 Do you sterilize the bottles before adding the kombucha? 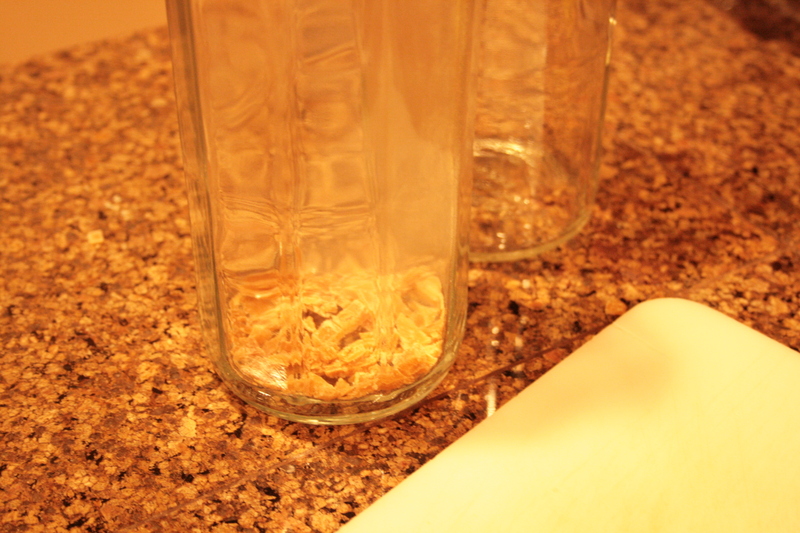 After using the bottles, I rinse them out with hot water right away and then air dry them. 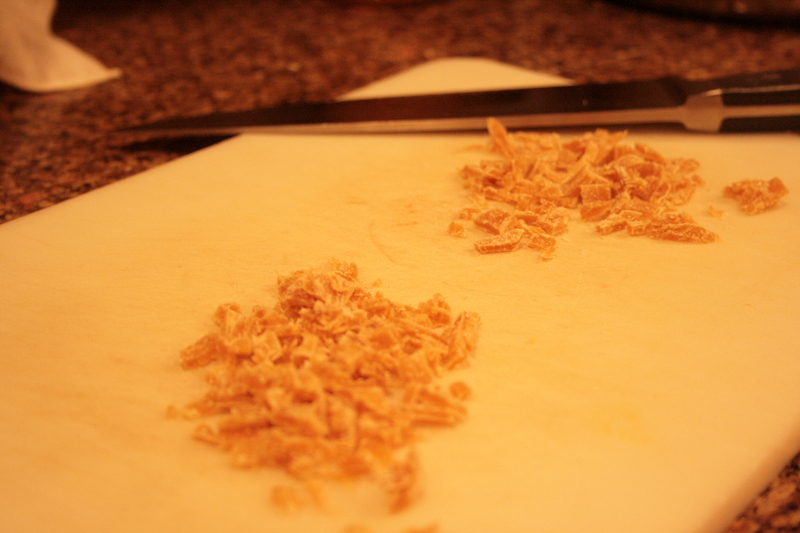 I cap them when dry and consider them clean for the next use. Kim gave me some starter today. I am excited to make my own. I love drinking this but even Azure’s is too expensive for me. Thanks for all your hard work!! How long does it need to set with the ginger to have a good flavor? Thanks! I have used rooibos tea a couple of times and that works excellent, both for the scobies (thick and firm) and for the taste. 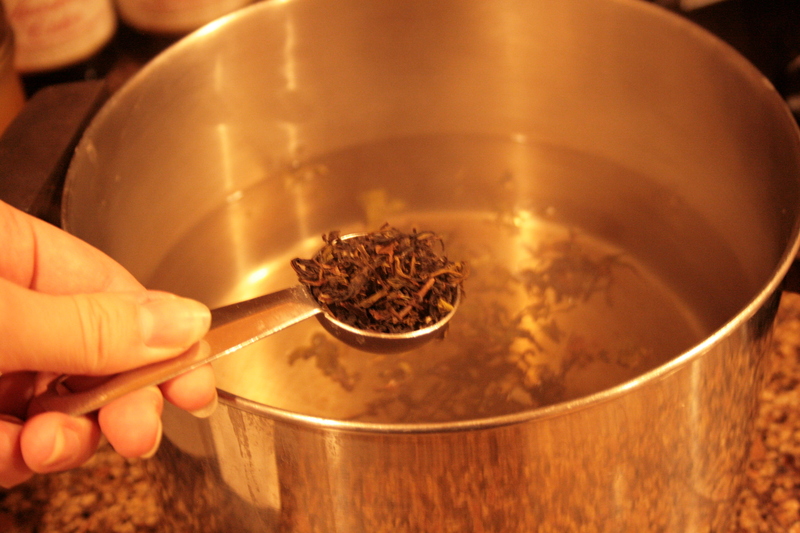 I’ve also used black tea with maracuya a couple of times and that works fine as well. 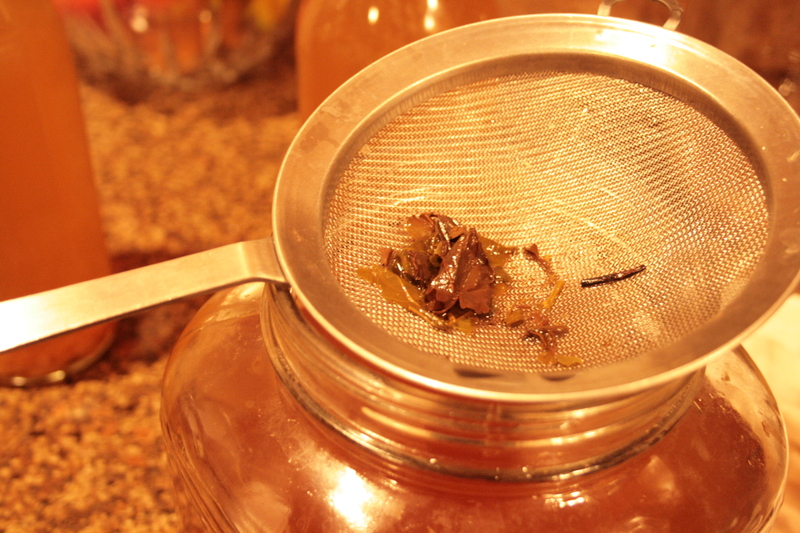 I mention the scoby thickness, because you can make kombucha with sugar and warm water alone. Only, the replication of the scoby won’t work, because the film on top of the liquid is very thin and not strong enough. 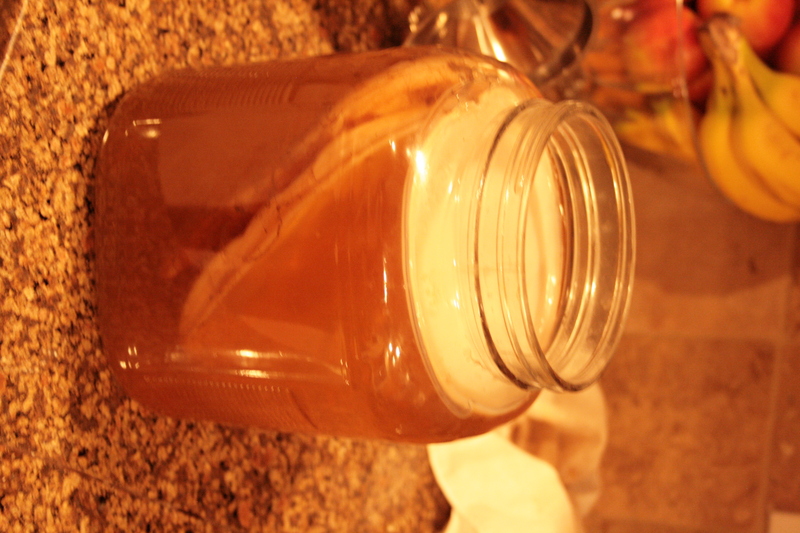 The mother scoby still lives, but probably also misses the minerals and other stuff in the tea. The taste in such a kombucha, without the tea, is doable but unpleasant. It’s not something you want to drink every day. I keep it to the rooibos and black tea with maracuya. I’m a beginner, so where would I get my hands on scoby to start my first batch? You can order one from culturesforhealth.com. Or, check Craigslist as there may be someone in your area willing to share. Another resource is your local Weston A Price chapter leader. No one seems to mention this on websites very often: You can make your own scoby if you buy a bottle of kombucha at a healthfoods store, pour off 2/3 of the kombucha and drink it. 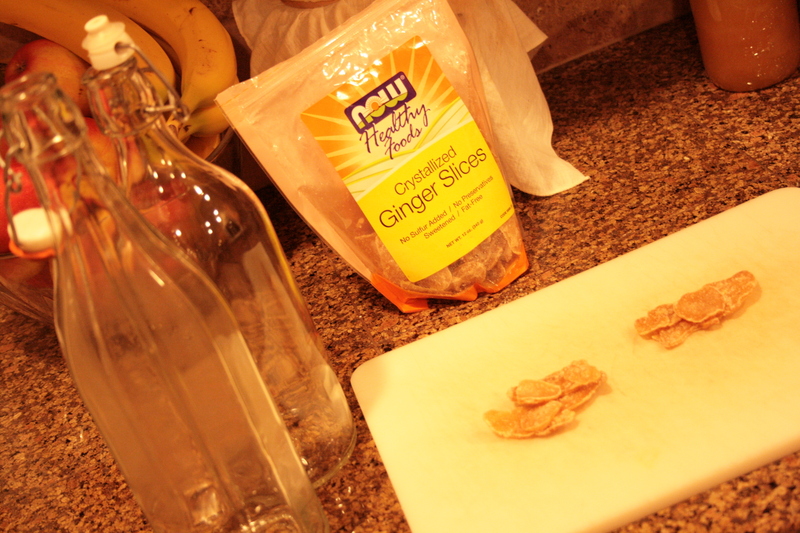 Leave the remaining kombucha in the bottle and cover it with a coffee fliter and rubberband. (DO NOT Drink out of the kombucha bottle if you plan to use it to create a kombucha mushroom/scoby because you will contaminate it! . Leave bottle in a dark cupboard undisturbed for two or three weeks. You’ll have a small rubber disk the diameter of the bottle but it’s big enough to use. 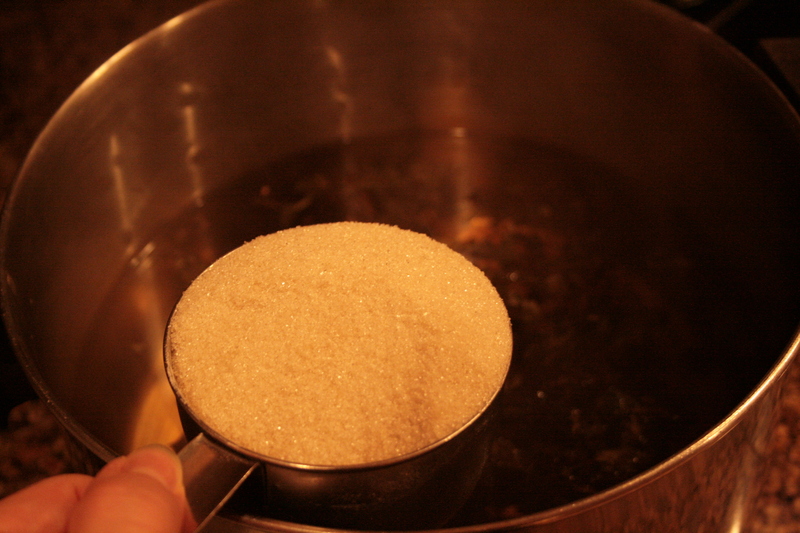 When you make your first batch you pour the scoby AND the juice it was sitting in, into your tea/water batch when you start. 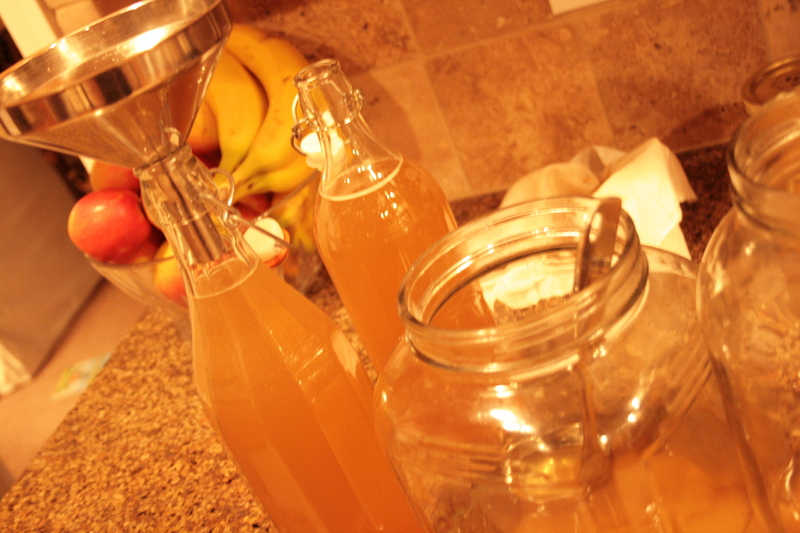 I”ve tried lots of things to flavor my kombucha and most of my friends agree the best flavor is apple & ginger. It cuts the vinegar taste. You put about 20% organic apple juice in your individual bottle and a few pieces of peeled & chopped ginger (probably equiv to about 1 tablespoon in a 16 oz bottle) and then let that sit four days with a tight cap. Will be very fizzy! It’s the best flavor I’ve found. I save kombucha bottles from the store, wash them in hot soapy water, rinse them with vinegar to remove soap residue. I would not recommend putting them in the dishwasher as the opening is to narrow for it to rinse well, unless you plan to re-rinse everything again to make sure the dishwasher soap is completely removed and then rinse with vinegar. I’ve also heard of people buying those hot steamer baby bottle cleaners to disinfect their bottles.